President Trump just announced he will be awarding conservative stalwart Orrin Hatch a huge honor on November 16th. Trump will be awarding him the nation’s highest civilian honor, The Medal of Freedom, and deserves it. “He has led the way in confirming qualified judges throughout the federal judiciary in order to protect our constitutional order, and has championed religious liberty, fought against communism, and stood on the side of freedom around the world,” the White House said in announcing the award. “Serving Utah for 42 years, and a good man, this is well deserved,” the incoming senator said. 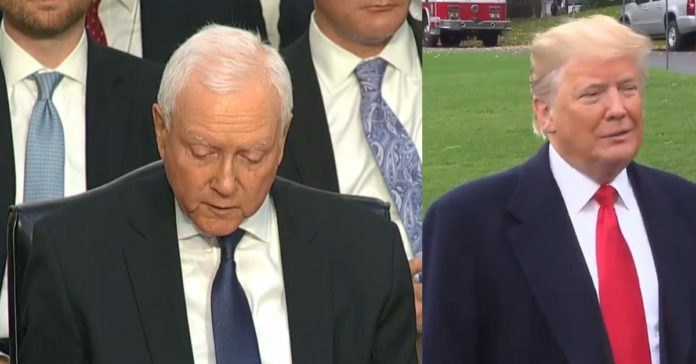 “Congratulations to my friend, Senator Hatch,” Mitt Romney tweeted. From The Hill: President Trump is set to award the Medal of Freedom to seven people next week, including Sen. Orrin Hatch (R-Utah), musician Elvis Presley, baseball Hall-of-Famer Babe Ruth and the late Supreme Court Justice Antonin Scalia. Others who are set to receive the medal Nov. 16 include Hall-of-Fame quarterback Roger Staubach, former Minnesota Supreme Court Justice Alan Page and philanthropist Miriam Adelson, the wife of GOP mega-donor Sheldon Adelson. “I’m proud of passing 800 bills,” Hatch said, “I’m proud of being the longest-serving Republican in history; I’m proud of being one of the few senators who has been chairman of three major committees.